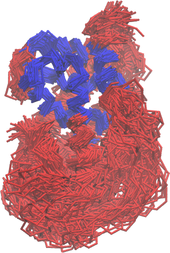 MDLovoFit is a package for the analysis of the mobility and structural fluctuation in Molecular Dynamics simulations. It allows the automatic identification of rigid and mobile regions of protein structures. For example, it is possible to automatically identifiy a stable region of a protein in simulation in which the protein displays high structural flexibility, as illustrated in the figure on the right. The regions of low mobility are automatically detected by the method. The software provides, as output, the Root-Mean-Square Deviations of the conserved structures, and of the divergent structures. A trajectory PDB file is output for the visualization of the results. If you have any problem, comment or suggestion regarding this package, please contact Leandro Martínez at leandro@iqm.unicamp.br.